One of the things I like most about trucking is that it brings me to places I've never been before and would never have good reason to visit. One of those places is the Bakken Shale, part of which resides under the state of North Dakota. 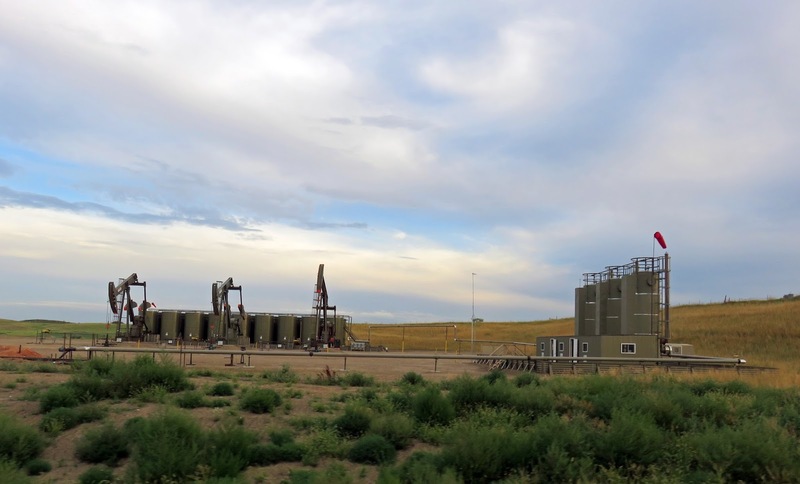 For years I've been wanting to visit the oil fields of Williston and Watford City. This is a part of North Dakota I've never been in, as we usually travel across the state via the only interstate highway that goes from east to west, I-94. Williston and Watford City are north of that interstate, Watford City can be reached in an hour, Williston in two. I was exited. I was finally going to see the place that made man camps famous. Watford City's population has more than quadrupled in five years. It's said to be slowing down, as many companies have stopped drilling due to the drop in oil prices, but there are still plenty of people up there tending to the needs of the oil fields. My favorite thing to see while driving through the fields - Texas has them too - are the natural gas flares. 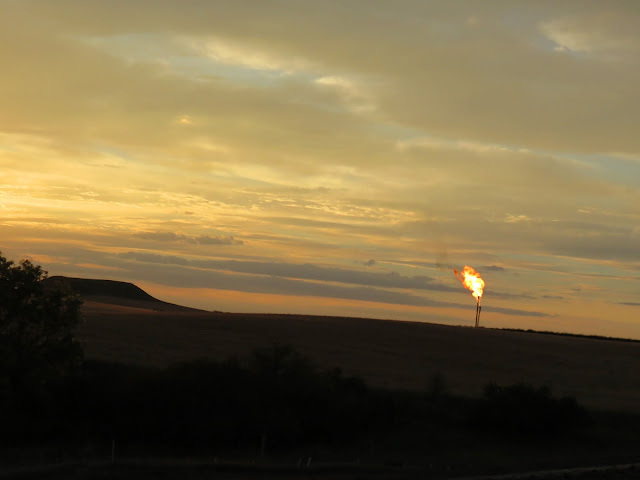 No major domestic oil field, as this 2011 New York Times article points out, flares as much as North Dakota does. The flames flicker above the landscape, like torches at a Tiki bar. They're pretty to look at, especially at night, but don't let that fool you. They emit millions of tons of carbon dioxide into the air, and waste 30 percent of the natural gas produced. All because it's cheaper to let the gas burn off than it is to collect and use as an energy source. It's just not worth as much as crude oil. 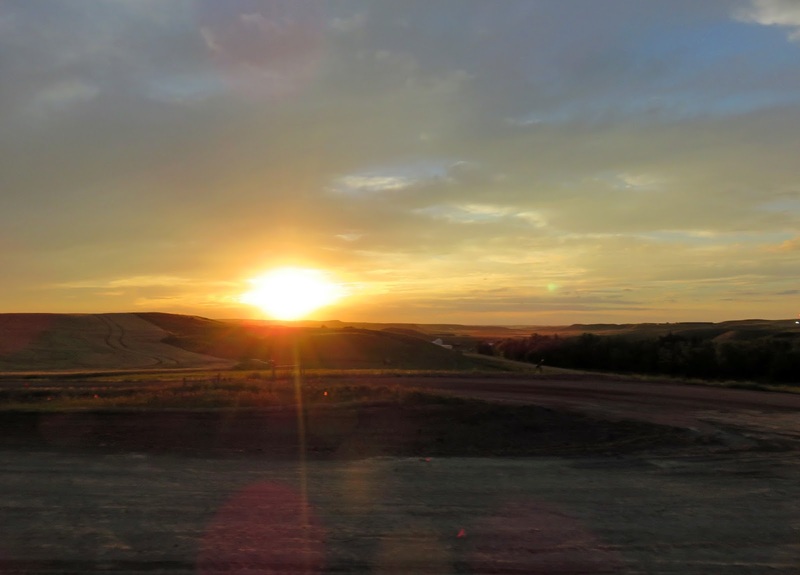 As we traveled through the towns, especially Watford City, we saw clusters of RVs, single wide trailers with three and four pickup trucks parked out front, indicating more than one guy in residence, and temporary dorm-like housing scattered between the oil derricks, pump jacks. The very man camps I spoke of earlier. There wasn't as much traffic and activity as I expected, but that was probably because it was a weekend. I'm sure the place is hopping on a regular work day. As of last year, North Dakota was producing more than a million barrels of oil per day, adding to the more than 9 million barrels produced daily in the United States. Anything can happen, of course, but it seems oil production will continue in North Dakota and other areas of the Bakken Formation for a very long time. Estimates of how many barrels of oil the Bakken contains - which have been likened to guessing how many jelly beans are in a jar - have ranged from 169 to 503 billion barrels. Ultimately, it's unknown. Yes, there's oil, and yes, that's a big reason why people come to this part of the country. But there's also some history up here. I'm not sure it's much of a tourist destination, but if you're passing through you might as well have an idea of who and what came before you. 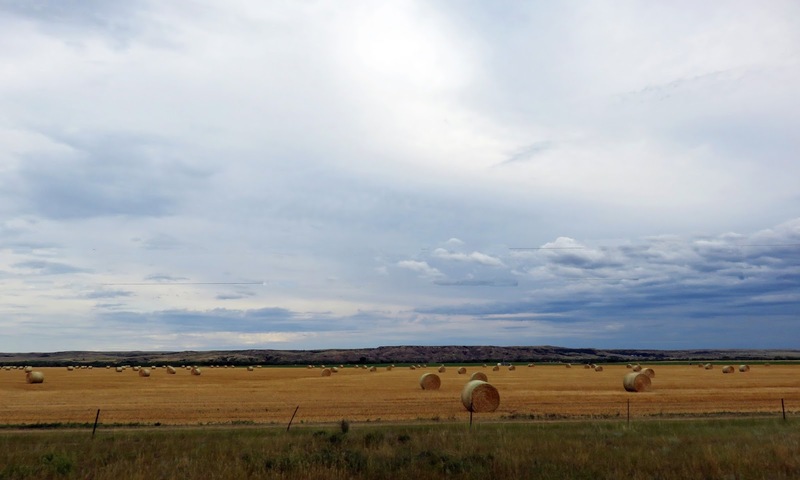 If you're interested in seeing the wide open, vast rolling hills of North Dakota, covered in round hay bales, you should probably go now. While it still exists. Just found your blog - it's great! My dad drove truck in the oilfield for 35 years - mostly in this part of the state - the oilfields around Watford City. When I went to school there it had a population of 1,500 now it's closer to 10,000. I live in Bismarck now but WC will always be home to me, no matter how much it changes. Cari Jean: Thanks for taking the time to comment! This part of the state was really interesting to see, I'm glad we were able to get through there. It's absolutely amazing how fast the population has increased! When your Dad was out there, he must have seen *literally* nothing for miles! It's wiiiide open! Hope you come back to read more of the blog and please feel free to share me with your family and friends!